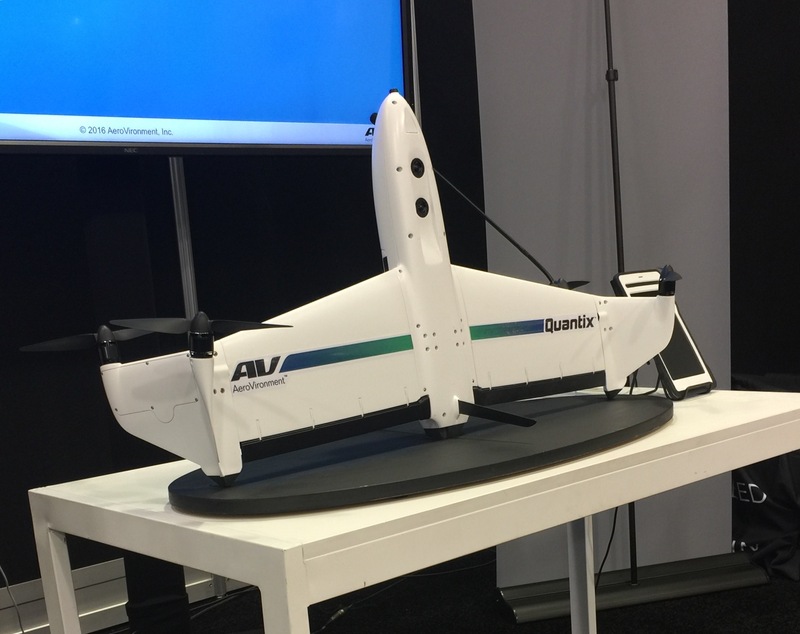 Unmanned aircraft systems manufacturer AeroVironment kicked off this year’s Drone World Expo in San Jose, California, by unveiling its new commercial Quantix drone and Decision Support System (DSS). The package includes the Quantix drone—a vertical takeoff and landing multirotor, multi-sensor system—with the company's DSS cloud-based analytics platform. Quantix is targeting the agricultural, energy and transportation markets, and AeroVironment is offering the system to customers in versions that include hardware only, hardware plus DSS or flight services that the company can provide for customers who don’t want to operate their own drones. “We believe this is the first practical, fully integrated solution for the commercial market,” said Wahid Nawabi, AeroVironment's president and CEO. “Customers don’t want to be experts at UAV operations and data analysis,” he added, noting that the Quantix drone is designed for long life, reliability and ease of operation. AeroVironment has manufactured tens of thousands of drones operating globally in harsh environments, he said, and has a track record of 45 years in this industry. The Quantix drone is equipped with four rotors, two on the ends of a single wing. A central fuselage is fitted with two cameras, one an RGB color camera for photographic image capture and a multispectral sensor with normalized difference vegetation index (NVDI) capabilities. All data is stored on SD cards, which can be removed post flight for local analysis or uploaded to AeroVironment’s DSS. Quantix is designed to operate from small spaces, thanks to its vertical takeoff and landing capability. The drone’s four rotors pull it straight up into the air, then it transitions to horizontal flight for mapping operations. Elevons on the wing trailing edge are used to control pitch when in horizontal flight mode. Yaw is controlled by varying the speed of the rotors. Endurance is about one hour, and 45-minute flights are typical. For landing, Quantix reverts to vertical mode and touches down on rugged fixtures built into the aft fuselage and wingtips. When power drops, Quantix will automatically return to the departure spot. If power is lost completely, it can glide and land with minimal damage. Stone explained that AeroVironment didn’t design Quantix by starting with a drone and adapting it to customers’ needs. “We started with the customer and built it backwards,” he said. “The entire system is focused on providing data that’s valuable and useful and interesting to the customer to help him run his business. It’s all about acquiring the data that helps customers make valuable business decisions, not about flying the coolest drone on the block. There are three main components to DSS: a dashboard, which is user-configurable; a mobile app for quick user data analysis and image annotation; and utilities, which can be customized for the end-user, such as an analysis tool that shows where trees (danger objects) are impinging on power lines, based on a predetermined buffer zone around the power lines. Support for Quantix will depend on the type of user. Agricultural customers will purchase the system and support from dealers and distributors, while oil and gas and transportation users will likely buy their own systems and develop their own capabilities for operations and support. Or AeroVironment can provide Quantix services to any customer. AeroVironment is not yet releasing pricing information on Quantix, and this will depend on how the buyer chooses to use the system, either by purchasing the hardware and operating the drone or by selecting AeroVironmnet to operate Quantix. DSS analytics packages are available in various forms, either by annual subscription or smaller chunks. AeroVironment also expects that some buyers will use Quantix drones to provide mapping/sensing business services. Quantix will begin shipping in spring 2017.